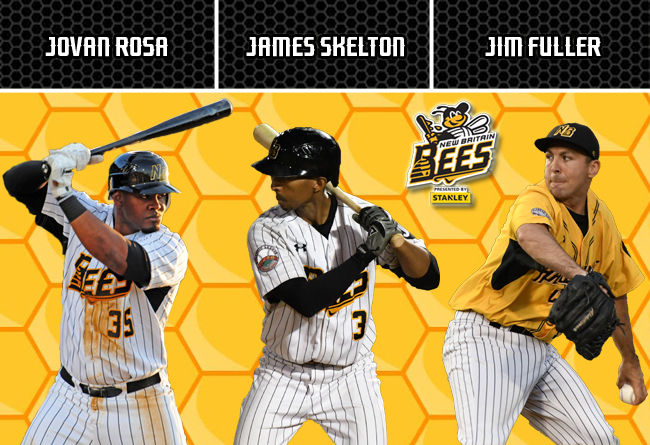 (New Britain, Conn., March 12, 2019) – The New Britain Bees today announced the signings of infielder Jovan Rosa, catcher James Skelton, and pitcher Jim Fuller. Jovan Rosa returns to New Britain for his fourth campaign with the Bees and fifth in the Atlantic League during his 12th season of professional baseball. The two-time Atlantic League All-Star began last year with Campeche of the Mexican League, and would finish up the season in the Hardware City. In 117 combined games, he posted a .271 batting average with 14 home runs, 60 RBI, and 45 runs scored. In 2017, Rosa was named to the post-season Atlantic League All-Star Team. He led the Atlantic League in games played (139), hits (159), and doubles (40), while also finishing second in at-bats (530) and total bases (246), third in extra-base hits (56), and tenth in batting average (.300). The slugger also posted 72 RBI and scored 59 runs. The 31-year-old graduated from East Hartford High School in 2005, and was drafted out of Florida Gateway College by the Chicago Cubs in the 2006 MLB Amateur Draft. After spending four seasons with the Cubs organization, Rosa made his Atlantic League debut in 2015 by splitting time between the Bridgeport Bluefish and Southern Maryland Blue Crabs. He joined the Bees the following season, playing in all 140 games and collecting a .283 batting average with 13 home runs, 31 doubles, 59 RBI and 56 runs scored. In 1,047 career minor league games, Jovan owns a .275 batting average with 88 home runs, 257 doubles, 536 RBI, and 427 runs scored. James Skelton returns for his fourth season with the Bees, seventh in the Atlantic League, and 16th of professional baseball. Last year with New Britain, the backstop appeared in 89 games, collecting a .255 batting average with 16 extra base hits, 45 runs scored, 33 RBI, and a .382 on-base percentage. The 33-year-old was originally drafted by the Detroit Tigers in the 14th round of the 2004 MLB amateur draft. He would spend five years in the Tigers organization, and continued to play in the affiliated ranks through 2012. Skelton peaked at the Triple-A level with Louisville (Reds) in 2011, and Syracuse (Nationals) in 2012. He made his Atlantic League debut in 2013, and has played in the league since with the Somerset Patriots, Lancaster Barnstormers, Southern Maryland Blue Crabs, and Bees. In 2017 with the Bees, he tied an all-time Atlantic League single-season record with 101 walks drawn. In 1,169 career minor league games, James owns a .258 batting average with 62 home runs, 438 RBI, 594 runs scored, 154 stolen bases, and a .389 on-base percentage. Jim Fuller returns to the Bees for his third season in the Atlantic League and 11th of professional baseball. Last year, the lefthander appeared in 43 games for New Britain, collecting a 2.09 ERA with two wins and 52 strikeouts in 43.0 innings of work. The 31-year-old holds a record of 32-23 with a 2.94 ERA and 497 strikeouts over the course of 469.0 innings pitched in 217 minor league appearances.